Inspired by space and the position of humans within such a vast void, Ekaterina Smirnova is a Russian artist, best known for her large-scale watercolor works. She brings a new dimension to this traditional medium, painting with large hardware brushes on rough textured paper, by splashing, spraying, wiping and washing. Her singular technique best represents the depth of the air, fading the further objects and sharpening the edge of the closer ones, and her breathtaking international landscapes appear to be even more intimate when painted large. By choosing bigger formats, the painter directs the viewers’ attention to not only the composition of her works, but to the complex textures as well. Stains, splashes, drips, and puddles, all are important elements to Ekaterina’s paintings, creating more nuanced atmospheres while calling attention to the process of the painting’s creation. “I believe that we are all artists and scientists naturally, since childhood. But not many of us continue to pursue those faculties. Yet, if you are a scientist, you are a dreamer. If you are an artist, you have an inquisitive mind. Both, an artist and a scientist have much in common, why would we not want to make this connection stronger?” In November 2014, for the first time in history, a robotic probe was landed on the comet 67P/Churyumov–Gerasimenko.The data received by the Rosetta mission of the European Space Agency inspired Smirnova to create a set of works of the comet. 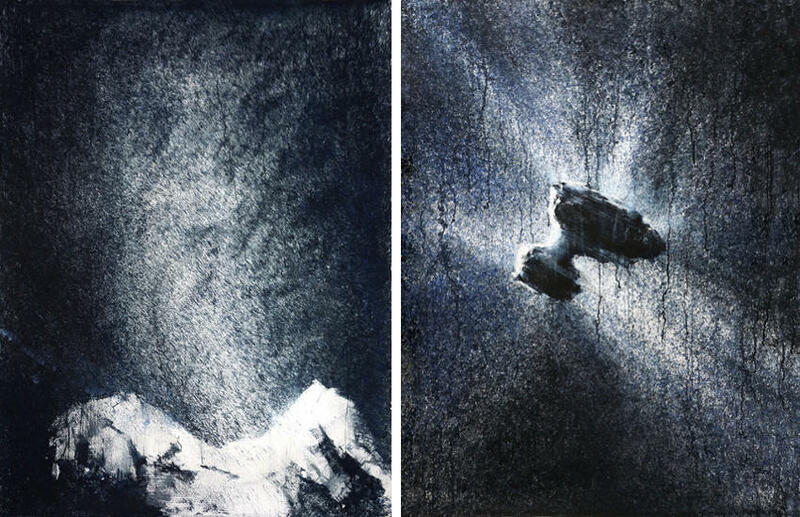 The paintings are based on the photography taken by the instruments on board of the spacecraft (OSIRIS, Nav. cam.). The focus of these paintings is the water of the comet, which helps to understand the origins of water on the planet Earth. To paint comet’s jets of vapor the painter used the splashing technique, vaporizing watercolor paint before it hits the paper. This allowed her to create an effect of mist, little droplets of water streaming with a strong force to the dark vacuum of space. Painting most of the work without touching paper with a brush, with 30 to 40 layers, helped Smirnova in achieving complex textures on the painting. Besides watercolor painting, Ekaterina Smirnova is perfectly able to express herself through other mediums. 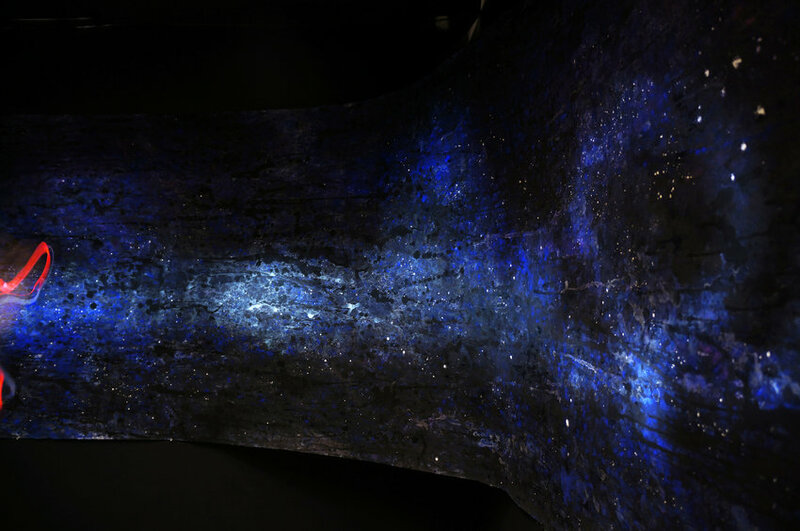 The Rosetta Mission inspired not just the series of paintings, but sculptures and music as well. From Light to Color is an interactive installation that focuses on the light and color. Since color can’t be seen by the human eye without light, we can say that color is light. In this work, she invited the viewers to discover color, using light. With the given flashlight, they would enter the dark room and find a small universe she had created. The flashlight is a very limited source of light, and the viewers are not able to see the whole painting at once. Being able to see only small sections of the work in front of them, they are encouraged to look deeper and try to understand the whole piece by focusing on the details. Our universe in endless and studying small parts of it helps the humanity to understand it better, step by step. Art, poetry, and science, all in one. Ekaterina Smirnova lives and works in Brooklyn, New York.